Singapore has been undergoing a fast growth scheme in a short time frame. No single person, no single firm or institution, not even a single government can solve all themselves. So, within the international Vertical Cities Asia competition, exactly this is challenged in the Paya Lebar area. How to house hundred-thousand people per square kilometre in the future? 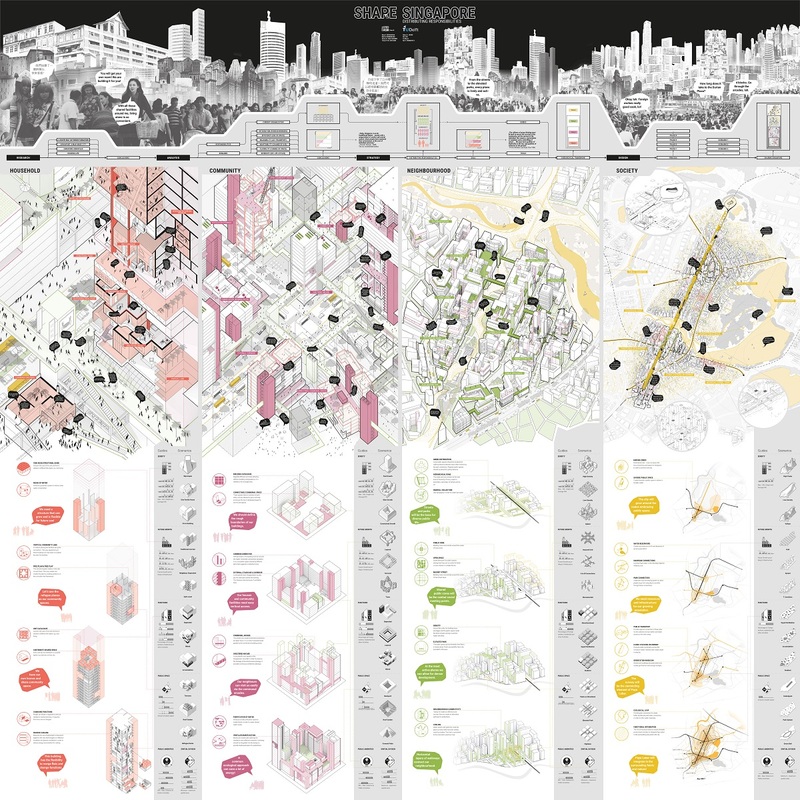 One of the two design propositions introduces a hierarchical framework to distribute the responsibilities on problem-solving into the city scales and their actors in order to enable all Singaporeans to contribute. This project is a manifesto in which a new organisational structure is created. It divides according to the people and their roles in the society – government and city; community representatives and neighbourhood; community and block; household and building unit. The goal is to tackle challenges that emerge from the location in the most efficient way. The second design propositions introduces nodes, which enable Singapore’s development area to absorb the massive scale into manageable portions that in themselves resist delusions of grandeur and neutralise the threat of an alienating confrontation between the ‘old’ and ‘new’ Singapore. Through design, it intends to set up physical space that provides the opportunities for social interaction, networks and self-expression for the people, and ultimately, housing, developing and bridging life towards a future of sustained vitality. The two proposition work best together. This entry was posted in architecture, design, event, exhibition, expo, human space, liveability, people, Singapore, urban design, urban space and tagged accessibility, appropriation, architecture, attap house, city plan, cross-cultural exchange, culture of the city, exhibition, experience, expo, globalisation, HDB, housing, Housing and Development Board Singapore, human needs, human scale, human space, infrastructure, kampong, liveability, meaning, Ministry of Home Affairs Singapore, Ministry of National Development Singapore, path systems, Paya Lebar, people, perception, public building, quality of life, rehabilitation, research, shophouse, Singapore, Singapore Improvement Trust, social behaviour, social cohesion, social connectedness, social sustainability, society, socio-spatial transformation, spatial strategies, standard of living, standards of life, The Great City, typology, urban design, urban development, urban fabric, urban fragmentation, urban life, urban planning, urban regeneration, urban rehabilitation, urban renewal, urban space, urban transformation, urban vitality, Vertical Cities Asia, World Future Foundation by Maurice Harteveld. Bookmark the permalink.